Enceladus is little bigger than a lump of rock and has appeared, until recently, as a mere pinprick of light in astronomers' telescopes. YetSaturn's tiny moon has suddenly become a major attraction for scientists. Many now believe it offers the best hope we have of discovering life on another world inside our solar system. The idea that a moon a mere 310 miles in diameter, orbiting in deep, cold space, 1bn miles from the sun, could provide a home for alien lifeforms may seem extraordinary. Nevertheless, a growing number of researchers consider this is a real prospect and argue that Enceladus should be rated a top priority for future space missions. This point is endorsed by astrobiologist Professor Charles Cockell of Edinburgh University. "If someone gave me several billion dollars to build whatever space probe I wanted, I would have no hesitation," he says. "I would construct one that could fly to Saturn and collect samples from Enceladus. I would go there rather than Mars or the icy moons of Jupiter, such as Europa, despite encouraging signs that they could support life. Primitive, bacteria-like lifeforms may indeed exist on these worlds but they are probably buried deep below their surfaces and will be difficult to access. On Enceladus, if there are lifeforms, they will be easy to pick up. They will be pouring into space." The cause of this unexpected interest in Enceladus – first observed by William Herschel in 1789 and named after one of the children of the Earth goddess Gaia – stems from a discovery made by the robot spacecraft Cassini, which has been in orbit of Saturn for the past eight years. The $3bn probe has shown that the little moon not only has an atmosphere, but that geysers of water are erupting from its surface into space. Even more astonishing has been its most recent discovery, which has shown that these geysers contain complex organic compounds, including propane, ethane, and acetylene. Plumes spurting ice particles, water vapor and trace organic compounds from the surface of Saturn's moon Enceladus. "It just about ticks every box you have when it comes to looking for life on another world," says Nasa astrobiologist Chris McKay. "It has got liquid water, organic material and a source of heat. It is hard to think of anything more enticing short of receiving a radio signal from aliens on Enceladus telling us to come and get them." 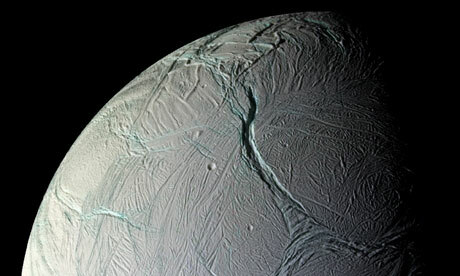 Cassini's observations suggest Enceladus possesses a subterranean ocean that is kept liquid by the moon's internal heat. "We are not sure where that energy is coming from," McKay admits. "The source is producing around 16 gigawatts of power and looks very like the geothermal energy sources we have on Earth – like the deep vents we see in our ocean beds and which bubble up hot gases." At the moon's south pole, Enceladus's underground ocean appears to rise close to the surface. At a few sites, cracks have developed and water is bubbling to the surface before being vented into space, along with complex organic chemicals that also appear to have built up in its sea. Equally remarkable is the impact of this water on Saturn. The planet is famed for its complex system of rings, made of bands of small particles in orbit round the planet. There are seven main rings: A, B, C, D, E, F and G, and the giant E-ring is linked directly with Enceladus. The water the moon vents into space turns into ice crystals and these feed the planet's E-ring. "If you turned off the geysers of Enceladus, the great E-ring of Saturn would disappear within a few years," says McKay. "For a little moon, Enceladus has quite an impact." Yet the discovery of Enceladus's strange geology was a fairly tentative affair, says Professor Michele Dougherty of Imperial College London. She was the principal investigator for Cassini's magnetometer instrument. "Cassini had been in orbit round Saturn for more than six months when it passed relatively close to Enceladus. Our results indicated that Saturn's magnetic field was being dragged round Enceladus in a way that suggested it had an atmosphere." So Dougherty and her colleagues asked the Cassini management to direct the probe to take a much closer look. This was agreed and in July 2005 Cassini moved in for a close-up study. "I didn't sleep for two nights before that," says Dougherty. "If Cassini found nothing we would have looked stupid and the management team might not have listened to us again." Her fears were groundless. Cassini swept over Enceladus at a height of 173km and showed that it did indeed possess an atmosphere, albeit a thin one consisting of water vapour, carbon dioxide, methane and nitrogen. "It was wonderful," says Dougherty. "I just thought: wow!" Subsequent sweeps over the moon then revealed those plumes of water. The only other body in the solar system, apart from Earth, possessing liquid water on its surface had been revealed. Finally came the discovery of organics, and the little moon went from being merely an interesting world to one that was utterly fascinating. "Those plumes do not represent a torrent," cautions McKay. "This is not the Mississippi pouring into space. The output is roughly equivalent to that of the Old Faithful geyser in Yellowstone national park. On the other hand, it would be enough to create a river that you could kayak down. "The fact that this water is being vented into space and is mixed with organic material is truly remarkable, however. It is an open invitation to go there. The place may as well have a big sign hanging over it saying: 'Free sample: take one now'." Collecting that sample will not be easy, however. At a distance of 1bn miles, Saturn and its moons are a difficult target. Cassini took almost seven years to get there after its launch from Cape Canaveral in 1997. 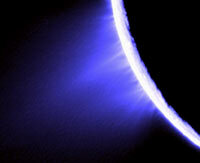 "A mission to Enceladus would take a similar time," says McKay. Once there, several years would be needed to make several sweeps over Enceladus to collect samples of water and organics. "Then we would need a further seven years to get those samples back to Earth." Such a mission would therefore involve almost 20 years of space flight – on top of the decade needed to plan it and to construct and launch the probe. "That's 30 years in all, a large chunk of any scientist's professional life," says McKay. McKay and a group of other Nasa scientists based at the Jet Propulsion Laboratory in Pasadena are undaunted, however. They are now finalising plans for an Enceladus Sample Return mission, which would involve putting a probe in orbit round Saturn. It would then use the gravity of the planet's biggest moon, Titan, to make sweeps over Enceladus. Plume samples would then be stored in a canister that would eventually be fired back to Earth on a seven-year return journey. Crucially, McKay and his colleagues believe such a mission could be carried out at a relatively modest cost – as part of Nasa's Discovery programme, which funds low-budget missions to explore the solar system. Previous probes have included Lunar Prospector, which studied the moon's geology; Stardust, which returned a sample of material scooped from a comet's tail; and Mars Pathfinder, which deployed a tiny motorised robot vehicle on the Red Planet in 1997. "The criteria for inclusion in the Discovery programme demand that any mission must cost less than $500m, though that does not include the price of launch," says McKay. "We think we can adapt the technology that was developed on the Stardust mission to build an Enceladus Sample Return. If so, we can keep the cost below $500m. We are finalising plans and will announce our proposals in autumn." Such a mission is backed by Dougherty. "I think Enceladus is one of the best bets we now have for finding life on another world in our solar system. It is certainly worth visiting but it is not the only hope we have. The icy moons of Jupiter – such as Ganymede, Callisto and Europa – still look a very good prospect as well." And there is one problematic issue concerning Enceladus: time. "Conditions for life there are good at present but we do not know how long they have been in existence," says McKay. "They might be recent or ancient. For life to have evolved, we need the latter to have been the case. At present, we have no idea about their duration, though geologists I have spoken to suggest that water and organics may have been there for a good while. The only way we will find out is to go there." The late entry of Enceladus in the race to find extraterrestrial life adds an intriguing new destination for astrobiologists in their hunt for aliens. Before its geysers were discovered, two main targets dominated their research: Mars and the icy moons of Jupiter. The former is the easiest to get to and has already received visits from dozens of probes. On 6 August, the $2.5bn robot rover Curiosity is set to land there and continue the hunt for life on the Red Planet. "For life to evolve you need liquid water, and although it is clear it once flowed on Mars, its continued existence there is debatable," says Cockell. "By contrast, you can see water pouring off Enceladus along with those organics." Many scientists argue that water could exist deep below the Martian surface, supporting bacteria-like lifeforms. However, these reservoirs could be many metres, if not kilometres, below Mars's surface and it could take decades to find them. Similarly, the oceans under the thick ice that covers Europa – and two other moons of Jupiter, Ganymede and Callisto – could also support life. But again, it will be extremely difficult for a robot probe to drill through the kilometres of ice that cover the oceans of these worlds. Enceladus, by these standards, is an easy destination – but a distant one that will take a long time to reach. "No matter where we look, it appears it will take two or three decades to get answers to our questions about the existence of life on other worlds in the solar system," says Cockell. "By that time, telescopes may have spotted signs of life on planets elsewhere in the galaxy. Our studies of extra-solar planets are getting more sophisticated, after all, and one day we may spot the presence of oxygen and water in our spectrographic studies of these distant worlds – an unambiguous indication that living entities exist there. However, telescopic studies of extra-solar planets won't reveal the nature of those lifeforms. Only by taking samples from planets in our solar system and returning them to laboratories on Earth, where we can study them, will we be able to reveal their exact nature and mode of replication – if they exist, of course. The little world of Enceladus could then have a lot to teach us.